The robot uprising has begun! Great for a necklace charm, or to hang in your car or home. 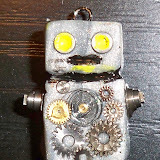 These tiny robots have gears from many broken watches, those robots are mean! Click on the picture of the robot below to see the photo album of robots. And don’t forget - Klaatu barada nikto.